Home » Recipes » Tasty Tuesday ~ Caprese Stuffed Garlic Butter Portabella! Tasty Tuesday ~ Caprese Stuffed Garlic Butter Portabella! 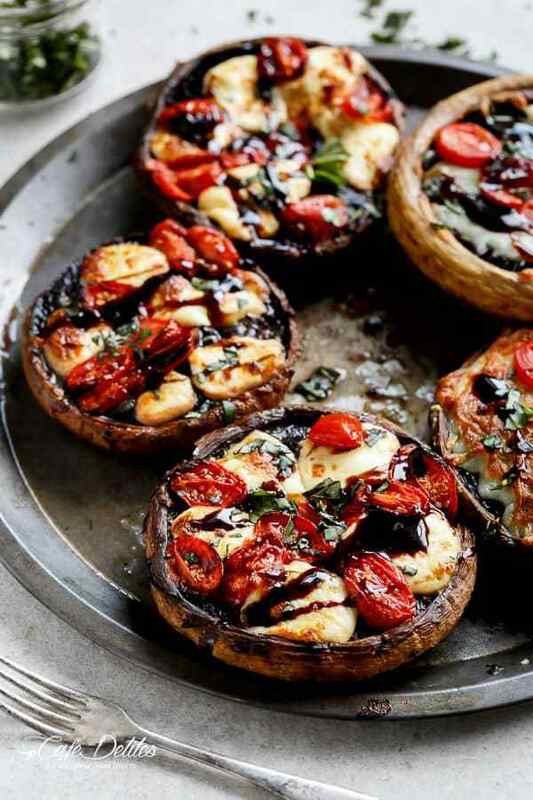 I can not wait to try these caprese stuffed mushrooms! I love portabellas and this recipe is low carb, healthy and perfect to enjoy for lunch, dinner or as a filling snack! Flip and brush any remaining garlic over the insides of each cap. Fill each mushroom with the mozzarella slices and tomatoes, and grill/broil until cheese has melted and golden in colour (about 8 minutes). If making from scratch, prepare while mushrooms are in the oven. Combine sugar (if using) and vinegar in a small saucepan over high heat and bring to the boil. Reduce heat to low; allow to simmer for 5-8 minutes or until mixture has thickened and reduced to a glaze. (If not using sugar, allow to reduce for 12-15 minutes on low heat). To dry Portabella, make sure you use a dry sheet pot paper towel per mushroom, and lightly press sheet into each mushroom to gently squeeze out the excess liquid. If this step is not done thoroughly, the Portabella will release a lot of liquid during cook time. Thank you to Café Delites for this yummy recipe. Click here for more recipes!! !